Model, born in 1891, fought in the German Army in World War I and won the Iron Cross (both classes), ending the war a lieutenant. During the inter-war years he became a believer in mechanized warfare, and after Hitler came to power in 1933 he made a favourable impression on the Führer and the Nazi hierarchy. Model fought in Poland, France and during the German advance into Russia in 1941 (becoming a panzer corps commander in October 1941). By January 1942, he was given command in the Rzhev salient, where the Ninth Army was in a desperate state, suffering from partisan attacks in its rear and threatened on three sides by the Red Army. 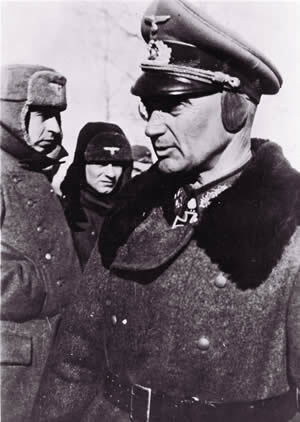 He pulled his command together by deploying a panzer corps around Rzhev and, despite stormy meetings with Hitler, held the salient for almost a year. When he was ordered to withdraw in early 1943, he authorized the systematic destruction of towns and their populations, an act that got him branded a war criminal by the Soviets. He commanded the Ninth Army at the Battle of Kursk, despite telling Hitler beforehand that he thought the offensive would fail. After Kursk, he conducted a magnificent fighting withdrawal in the Ukraine, earning the nickname the “lion of the defence” as his Ninth Army retreated with Army Group Centre. Hitler decided that he had saved the Eastern Front from collapse (which he had indeed helped to do), and promptly sent him to France in mid-August as Commander-in-Chief West to stave off the British and Americans. In early 1945, Model and his Army Group B were encircled in the Ruhr Pocket. After declaring “a field marshal does not become a prisoner”, he walked into woods near Duisberg and shot himself on April 21, 1945.